Published: Jan. 16, 2014 at 10:58 a.m. 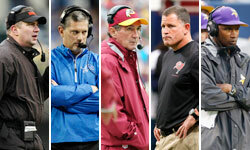 Updated: Jan. 16, 2014 at 04:16 p.m.
One day after landing his long-awaited first head coaching job with the Minnesota Vikings, Mike Zimmer has lined up offensive and defensive coordinators. A source informed of the process has told NFL Media Insider Ian Rapoport that the Vikings are "almost done" with a deal to hire Browns offensive coordinator Norv Turner for the same position on Zimmer's staff. There is optimism from all sides that the deal will get done, per Rapoport. Two sources with knowledge of the team's thinking also have informed Rapoport that Dolphins linebackers coach George Edwards will be a strong candidate to work under Zimmer as the defensive coordinator. The Vikings will interview several candidates for the job, but Edwards is the heavy favorite. Whereas Edwards' potential role would be limited with Zimmer calling the shots on defense, Turner likely will have free rein over the offense. His son, Scott, is expected to join him on the coaching staff. One of the NFL's most respected offensive minds since calling plays for the Cowboys' "Triplets" in the early 1990s, Turner is known for a strong ground attack and an aggressive, vertical passing game. Adrian Peterson will remain the focal point of the offense regardless of the starting quarterback. It will be interesting to see how Turner uses Cordarrelle Patterson, who was primarily a run-after-catch threat as a rookie. He has a similar skill set to Julio Jones and Demaryius Thomas, both of whom specialize in bubble screens, slants and crossing routes mixed with a few deep strikes per game.